Thanksgiving is on the way and we’re fielding lots of phone calls about how to properly prepare a turkey brine for the amazing Heritage turkeys that our friend Lynn raised for us this year. Different people have different philosophies about the necessity and benefit of turkey brine, but plenty of adherents believe that brining not only seasons the meat, but that it also keeps it moist and tender during cooking. If you’d like to give it a try this year, Joe has graciously offered up his recipe and instructions for the perfect Thanksgiving turkey brine. This is a simple method to make a moist, flavorful turkey that you will be proud of. You need to do this the day before you want to roast your turkey, so plan ahead. If your outside temperature is below 40 degrees you can store the turkey in a shady spot or in the garage while it brines, otherwise you will need to clear out a spot in a refrigerator… Not an easy task the day before Thanksgiving. To make your brine solution, bring the water to a boil in a large soup pot. Add the salt and sugar and stir to dissolve. Add the seasoning and the cold water. Let the brine mixture sit for about 30 minutes before you add your turkey. Take the turkey out of the brine and put it on roasting rack in a roasting pan. Allow to dry for 15 minutes, then rub a little oil or butter on the skin. DO NOT SALT THE TURKEY. Put 2 cups of water or broth in the bottom of the roasting pan and tent the turkey with foil. Remove foil tent when you have about 1 hour of roasting time left. Remove the turkey from oven and place on cutting board where it should rest for 20 minutes before you carving. There is something so elegant about grass fed Filet Mignon medallions drizzled in a savory pan sauce reduction. And it’s so easy! In just 30 minutes, you can prepare a dazzling grass-fed beef entrée. But first, let’s review the basics: Filet Mignon is simply a cut portion of the beef tenderloin. The tenderloin comes from the middle of the cow and, as it’s name suggests, is the tenderest part of the animal. Tenderloins are also one of the least used muscles of the animal which lends to its attractive texture. Finishing your filets with a sauce reduction creates a delicious, sophisticated entrée. Here are three sauce reduction recipes suggested by Jessica to top off your Kettle Range filets: Cabernet Sauce, Peppercorn Sauce, and Balsamic Sauce. Melt 1 tablespoon butter in heavy large skillet over medium-high heat. Sprinkle both sides of steaks with salt and generous amount of ground black pepper. Add to skillet and cook to desired doneness, about 4 minutes per side for medium. Transfer steaks to 4 plates. Tent with foil. Melt 1 tablespoon butter in same skillet over medium-high heat. Add shallots; sauté 1 minute. Add wine, capers, and mustard; simmer until slightly thickened, about 2 minutes. Stir in parsley. Reduce heat to medium-low. Whisk in remaining 2 tablespoons butter. Season sauce with salt and pepper. Spoon over steaks. Put the cornstarch into a cup. Add the water, stirring to dissolve. In a medium saucepan, whisk together the cornstarch mixture and the broth. Bring to a broil over high heat; cook until slightly thickened, stirring occasionally. Stir in the bay leaf and thyme. Reduce the heat to medium-high and cook for 10 to 12 minutes, or until the sauce is reduced to about 1 cup. Stir in the wine and peppercorns. Combine the rub ingredients in a bowl. Rub over the filet mignon to lightly coat the steaks, and set aside on a plate for 10 minutes at room temperature. Place a sturdy skillet on the stove top. Heat the olive oil, tilting the pan so it spreads evenly and spray with the oil if needed to fully coat pan. Once the pan is good and hot, add the filet mignon to the pan. Sear on one side for about 4 minutes, then flip to cook for about 4 more minutes. Check for doneness after cooking on both sides. After the 8 minutes cooking, steak can be quite rare. Move the skillet to the oven, roast there for another 4 minutes to get them cooked to the medium/ medium rare. Keep in mind the steaks will cook a bit more when they rest. When the filets are cooked, remove from the pan, place on a platter to rest, loosely covered with foil. Return the skillet to the stove on medium high heat. Add two tbsp of butter to melt. Stir it in and scrape up the bits of meat and fat to incorporate into the sauce. Add the shallots, cook about 3 minutes until they begin to soften. Add the balsamic vinegar and sugar, cook for about 3 more minutes so that the sauce thickens a bit. Finish by stirring in the final tbsp of butter until it is melted. Pour the sauce into a bowl, stir in the truffle oil if you are using. Place one filet on the plate of each of your lucky dinner companions. You can serve it with the sauce or let them take what they want at the table. When the weather turns cool, we like a hearty and nourishing slow cooker recipe that leaves us with plenty of leftovers to heat up during the week. We’ll be sending you some of our staff favorites over the coming months, and we thought we would get a start this week with Mark’s favorite Slow Cooker Split Pea Soup with Smoked Hocks recipe. This particular recipe is an almost effortless act of alchemy, transforming dried peas and a few simple ingredients into an incredibly creamy, hearty meal that feeds 8-10 people. The ingredients are simple and easy to come by, and the preparation is easier still, requiring only a few minutes of prep time, and then patience… The secret ingredient, of course, is a delicious house smoked pork hock from Kettle Range (antibiotic free, of course!). Layer the peas in the bottom of the slow cooker. Add the chopped vegetables, garlic, parsley and the bay leaf–you don’t even need to mix it up. Set the smoked pork hock gently on top. Add the chicken broth, water, and salt and pepper. Now, if you have the time, set your slow cooker on Low for 8-10 hours and enjoy your day. If you’re in a hurry, 5 hours on the High setting should do it. 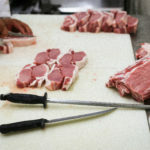 After it is done cooking, it should be easy to separate the meat from the bone with a fork. Be careful not to burn your fingers! Remove the bone and serve–We like it with some warm corn bread or a crusty chuck of sheepherder’s bread. Want a bit more spice in your Split Pea Soup? 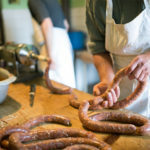 How about adding some of Jerry’s Smoked Andouille sausage? It’s precooked. Just slice it into bite-size pieces and add to the slow cooker at the same time you add the hocks. Delicious!